After all the excitement from the amazing food and conversations about food on Friday night, I could not imagine that Saturday would be able to rise to a similar level. Man, was I wrong. We started the day with a trip back to Brooklyn, to the Bushwick neighborhood this time. Our destination was Roberta’s, a pizza place known for its brunch. We were supposed to meet with a guy who has an idea and a prototype for a mobile chat application that could be of interest to members of The Salt Cured Pig. As we arrived, the first thing that I noticed was that Bushwick appears to be the center of the hipster universe. This meant that with my full, bushy beard, I was not totally out of place. We sat down and prepared to order when the final member of our party arrived. Michael Ruhlman, the well-known chef and author (or co-author) of such works as Charcuterie, Salumi and Ratio. I have to admit that I was a bit starstruck. Michael spoke with each of us about what we do, our involvement with The Salt Cured Pig and its new parent group The Handcrafted Larder, and he seemed genuinely interested in what each of us had to say. I have seen Michael Ruhlman on TV or online many times (as a judge on “Iron Chef America” and as a road trip companion of Anthony Bourdain on an episode of “No Reservations”), though I had no idea how personable he would be in our face to face encounter. We chatted a bit about the charcuterie plate we had ordered while waiting for our pizza to arrive. We all agreed that none of it was remarkable, but that everything except the nduja on it was a topping for a pizza, so eating it as appetizers may not have shown it in its best light. As we finished our meal and conversation, I was unable to restrain my inner fanboy and told him how much I have enjoyed learning about food from his blog and books. He accepted my admiration with humility and thanked me for my kind words. It was an unexpected encounter with a true food celebrity and a very enjoyable one at that. 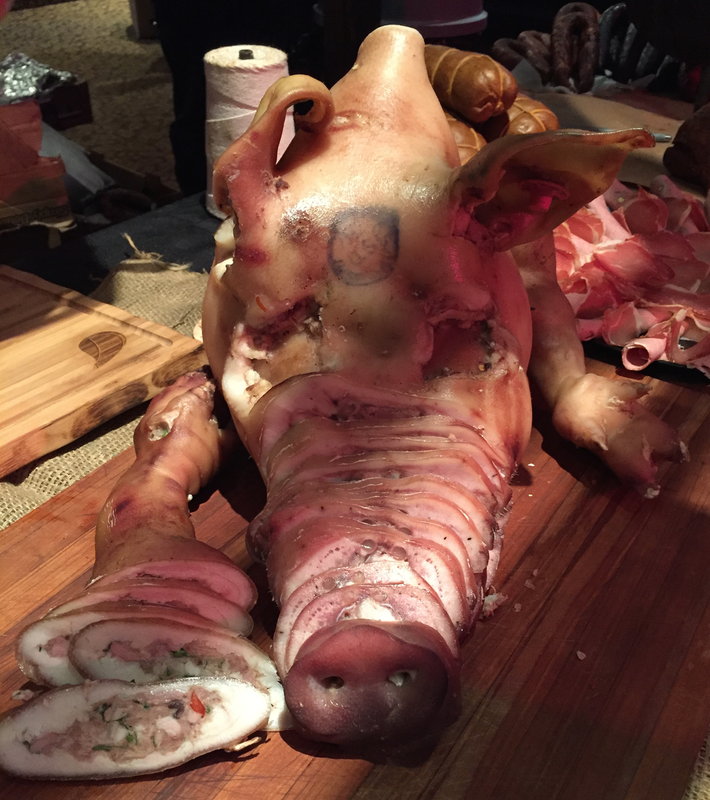 Most of the rest of the day was devoted to the Charcuterie Masters event at the Flushing Town Hall. There I got to meet several fellow members of The Salt Cured Pig who I had previously only known online. The standout interaction of the afternoon was having an extended conversation with Bob del Grosso. Bob is a chef, formerly on the faculty of the Culinary Institute of America and currently at Drexel University. Bob is also one of my favorite food people who spends a good bit of time online. He doesn’t take himself or life too seriously and can even be seen on Facebook joking about the irony of the current popular fascination with bone broth or wearing a hat he has manufactured from ramps and chicken wire. Bob and I swapped several stories of working in restaurant and home kitchens. Inevitably, we also ended up talking about bone broth. For those who think that Bob only jokes about that subject, you should know that Bob has conducted quite a bit of research and can seriously converse about how bone broth has been represented in culinary history and fully debunking the fantastical claims of impossible health benefits associated with its consumption. Finally, we got down to the main event. Having volunteered to assist with the judging of the competition, I set up the process for how each entry was accepted, documented and passed to the judges for their input. This kept the judges unaware of who submitted each entry and allowed them to assess each one without bias. Working primarily behind the scenes, I did not sample too many of the multitude of varieties of charcuterie. 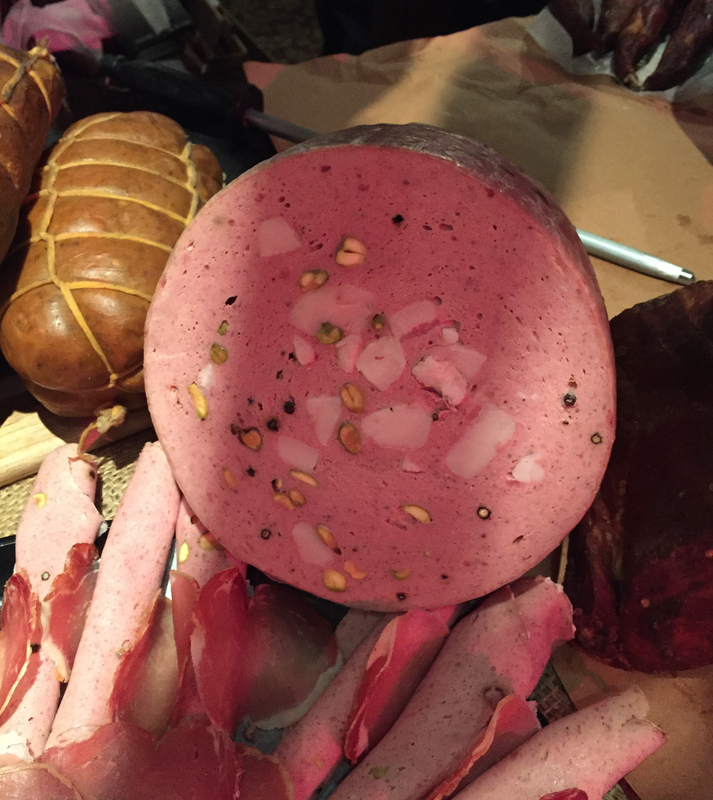 I did taste some amazing fennel salami that Steven Jagoda made (it was the winner in its category). I also tried a couple jamon pata negra samples (one aged 24 months and one aged 36 months), coppa di testa, and the best pistachio-studded mortadella I have ever had that Rodrigo Duarte of Caseiro E Bom provided. It was an excellent event to cap off a great day. This entry was posted in Charcuterie, Travel food. Bookmark the permalink.